India’s largest business by revenue, Tata Group comprises no less than 289 businesses that together have just breached the $100bn annual turnover mark. Though Tata Group shows no signs of slowing down, chairman Natarajan Chandrasekaran of the holding company Tata Sons is determined to streamline the organisational structure of the corporate behemoth in order to vastly increase operational efficiency, explore synergies, and push up profits. Tata Group has a stake in industries covering nearly the entire spectrum of entrepreneurial activities from growing food to building military hardware and exploring artificial intelligence – and pretty much everything in between. Mr Chandrasekaran wants to weed out marginal businesses: “If we cannot scale and we cannot consolidate them, then we have to look if maybe there is a better place where that business can flourish.” The current chairman was parachuted into his job after his predecessor was summarily dismissed early last year at the conclusion of a public and rather embarrassing dispute regarding the group’s lagging performance. Excluding the highly profitable IT services provider Tata Consultancy Services, the conglomerate saw its after-tax profits shrink by staggering 72% over a five-year period. Natarajan Chandrasekaran was brought in to revert the downward trend and repower India’s flagship company. Though the chairman declines to specify the business he considers ripe for divestment, he has already begun offloading some of the group’s minor members such as a business consultancy and a pharmaceutical research company. Late last year, he also sold Tata Group’s consumer-facing telecoms business to its rival Bharti Airtel for an undisclosed sum. Described in The Economist as a corporation like no other due to its vast scale, palace politics, and historic sense of moral purpose, Tata Group defies categorisation. Now that some of the more pressing issues facing the conglomerate have been addressed, Natarajan Chandrasekaran – Chandra for short – must find a new corporate framework for his still rather unwieldy charge. As corporate vessels go, Tata Group is huge and made up of superlatives: the group employs slightly under 700,000 people and represents an estimated market value of $155bn. Tata is synonymous with India. The company, founded in 1868 and already a considerable force in the market by the turn of the century, was an early supporter of ndia’s independence and its hero Mahatma Ghandi. Already long before the British let go of the jewel in their colonial crown, Tata companies were instrumental in the country’s industrialisation effort. Later, in the 1990s, Tata helped shape the IT outsourcing revolution which transformed the country into a software development powerhouse. Even though in the 1990s Tata Group embarked on an ambitious and ultimately successful global expansion drive, the company failed to mind and nurture its bottom line. Under Mr Chandrasekaran’s predecessor, the company was accused of navel gazing – paralysed by analysis. That has now all changed. 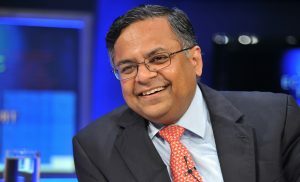 The new chairman earned his spurs at Tata consultancy Services (TCS) which under his guidance grew into a $60bn business. Chandra is also one of the only a handful of Tata executives able to use his stellar track record to face down former chairman Ratan Tata who relinquished his control of the group in 2012 but remains a larger-than-life behind the scenes presence. Mr Chandrasekaran is now busy to bring the holding company back to its roots as a source of knowledge and funding for its operational businesses – streamlining internal processes and lines of communication whilst extracting synergies from the group’s constituent parts. He also aims to lessen the burden of history which has made Tata, in the eyes of many, as a vehicle of national development rather than a corporation owing a fiduciary duty to its shareholders. The resulting picture may indeed be less romantic but just might ensure the company’s longevity and help write another 150+ years of Indian corporate history.